Heat oil in large lidded saute pan. When hot, add sausages and brown evenly on all sides. Remove sausages from pan, cut in half, and set aside. Add onions to pan with butter and sprinkle somewhat generously (about 1+ teaspoon) with kosher salt. Over medium low heat, turn onions often until brown and beginning to caramelize. Turn off heat. Add balsamic and chicken stock and deglaze the pan. 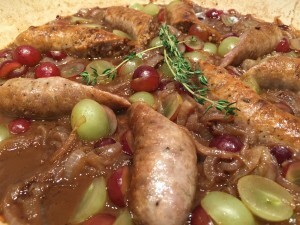 Put back sausages, add grapes, and thyme sprigs. Par Cooked. Needs 20-25 additional minutes per instructions below. Put on lid. The dinner may be par cooked until this point. We let this rest for about 90 minutes before our guests arrived and we started on our salad course. To finish, turn on medium high heat and cook, with lid slightly ajar, for 20-25 minutes until sausages are cooked through and liquid has reduced down to about 1/4 cup. Serve over creamy polenta (we make ours with chicken stock, a touch of cream, salt, pepper, and chopped fresh thyme to taste). We topped our plates with a little chopped fresh Italian parsley. Divine! The combination of spicy hot, sweet, and sour is sublime. Truly an unforgettable pairing that your guests will love! I made this last week and it was out of this world! My boyfriend and I decided it would become a staple in our house. Thanks for the recipe!